The Avg. Group Discount is 3.9%! Average breakfast, average water pressure, average overall experience. Truck window smashed in the parking lot one evening, elevator broken down one day and a stairwell closed for maintenance at the same time!? Lastly a terrible reservation cancellation policies for team bookings made things very expensive for our team. 15-Jan-2018 Verified Review, stayed from Fri Jan 12 to Sun Jan 14 2018 at a C$159.99 group rate (23% discount). Welcome to the Fairfield Inn & Suites by Marriott Guelph! - We offer brand new accommodations with a variety of suites and cutting edge business amenities. Stay connected with complimentary high speed wired & wireless internet, and a fully equipped 24hr Business Centre. Located in the heart of the Hanlon Business Park and just minutes away from Hwy 401 with easy access to Toronto, Hamilton, Cambridge, London, and Kitchener/Waterloo. Located near Linamar, Sleeman's Brewery, The Co-operators, DENSO, RIM, University of Guelph, Stone Road Mall, Sleeman Centre, Government offices and many more major corporations & attractions. If you are coming to Guelph for fun, the Fairfield Inn & Suites by Marriott Guelph marks the city's first and only hotel waterslide. A Perfect location for family getaways and sports teams. On your next trip to Southwestern Ontario come stay at the Fairfield Inn & Suites by Marriott Guelph. 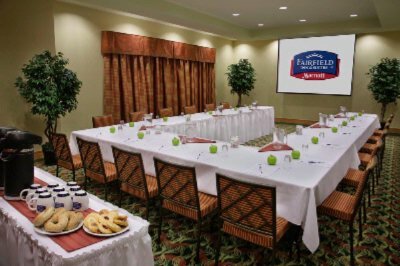 Below are the meeting, banquet, conference and event spaces at Fairfield Inn & Suites. Feel free to use the Fairfield Inn & Suites meeting space capacities chart below to help in your event planning. Hotel Planner specializes in Guelph event planning for sleeping rooms and meeting space for corporate events, weddings, parties, conventions, negotiated rates and trade shows. 35 x 24 x 12 Ft.
10 x 25 x 0 Ft.
35 x 22 x 10 Ft.